The NASAA Series 66 Uniform Combined State Law Examination is one of the most challenging securities licensing exams. “The Solomon Exam Prep Guide to the Series 66” works in three ways to help you tackle this exam with confidence. This study guide focuses on the most important aspects of the exam, it provides you with practice questions and reminds you why you have to take the test in the first place: to protect investors. 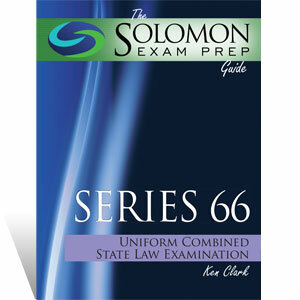 “The Solomon Exam Prep Guide to the Series 66" comes with two complete practice exams, short quizzes and suggested note cards, as well as a glossary. I just passed the Series 66 exam and found that the Solomon Exam Prep materials are the way to go when preparing for this exam. The advice given from the get-go is spot on; if you think you can cram for this course, forget it. Use the materials as advised and you'll do well. The format of the practice exams closely simulate the way the questions are presented on the test itself. I had 2 prep materials, Solomon's and another and I honestly believe Solomon's was the one that helped the most. I truly wish I had tried Solomon Exam Prep earlier! Started studying for the Series 65 exam with a different company and missed passing the test by 4 questions. I was pretty disappointed because my study materials, especially the quiz generator, weren't a great reflection of what the test would actually be like. But Solomon's Exam Simulator was the KEY to passing my second go-around! Questions were very similar to the actual exam and I managed to boost my score by 10% from the first time, only using the Solomon materials for less than a week! HIGHLY recommend this to anyone in need of 65 materials!